In an earlier post I had moaned about the journey down to Cornwall being uninteresting, but when returning home I remembered a couple of land marks that stand out even if they are viewed from the motorway near Bridgwater. They are right beside each other. 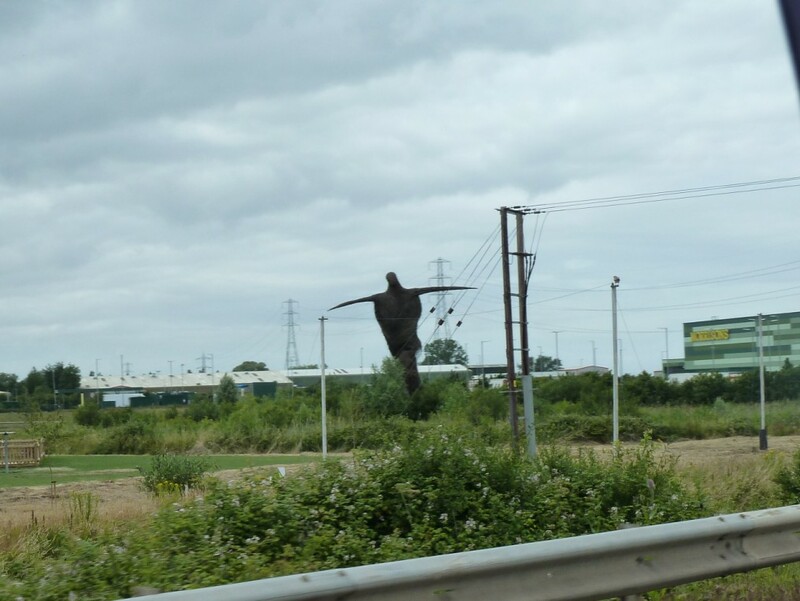 The giant Willowman statue looming 40 feet high, overlooking the M5 and the giant Morrisons supermarket distribution centre.. The weather was dry, but overcast. 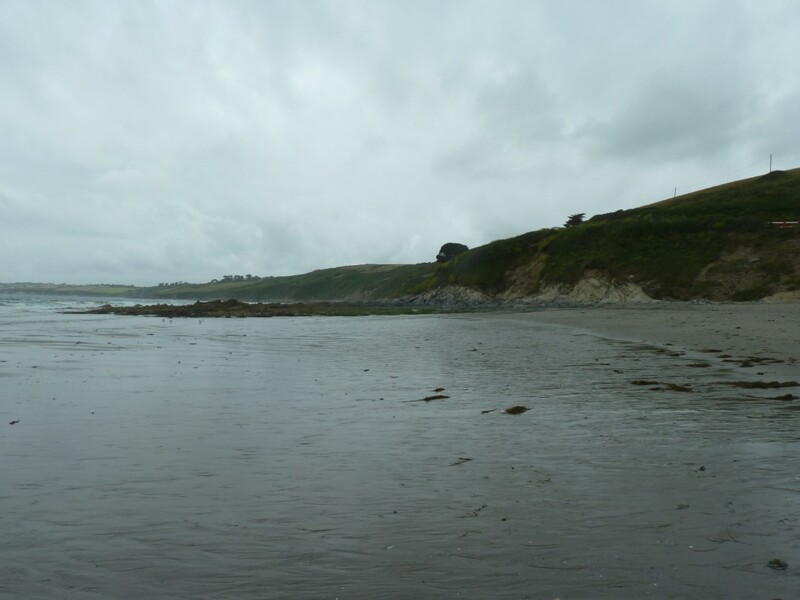 We set off on the short drive to Pendower beach situated at the end of a single track lane. 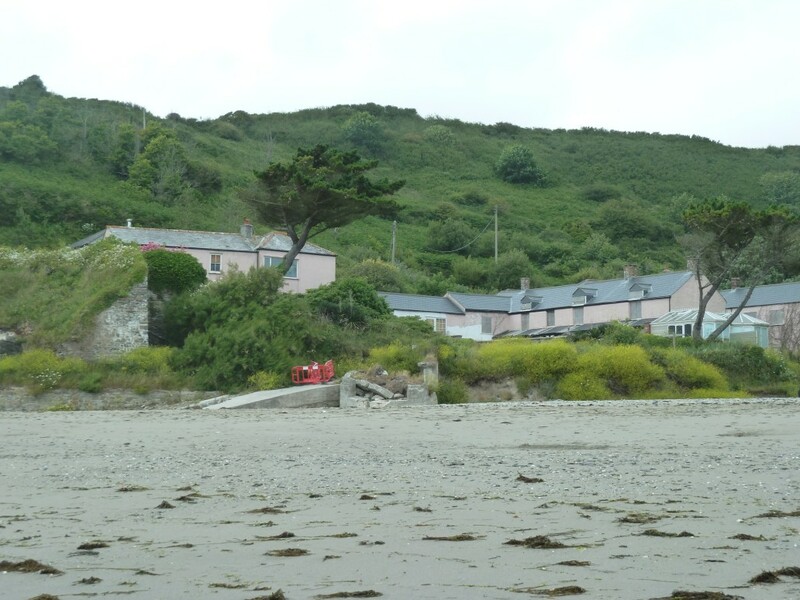 From the small parking area we walked down past the Pendower Beach Hotel known locally as the Pink Hotel. The hotel has stood derelict and boarded up for three years due to protests against its redevelopment. A quick paddle in the sea and we were back up to the camper for a picnic lunch. This is the now compulsory photo when visiting St Mawes. The old petrol pumps showing the price as 2 shillings and 3d per gallon . After another trip into Truro yesterday I found a suitable bowl to replace the one I broke. Harmony has returned to the campervan. 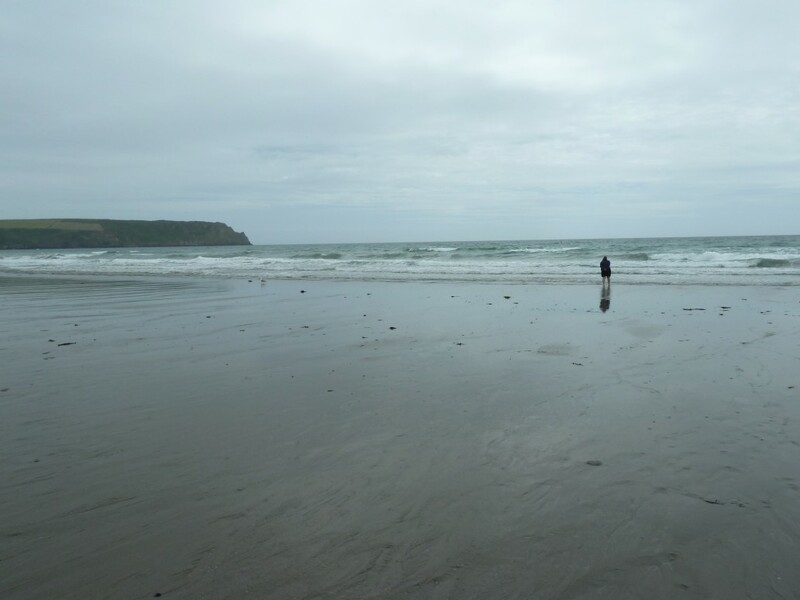 The weather forecast was good for Thursday, so we decided to visit the southern end of Cornwall. 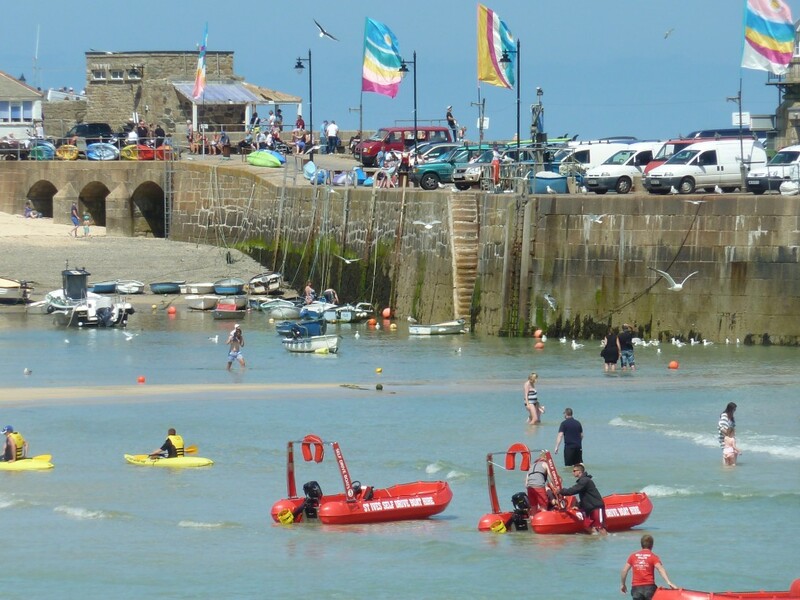 Parking in St Ives is horrendous and the main car park is at the top of a steep hill above the town. Great to walk down, but after a long hot day it can be a trudge to climb back up. 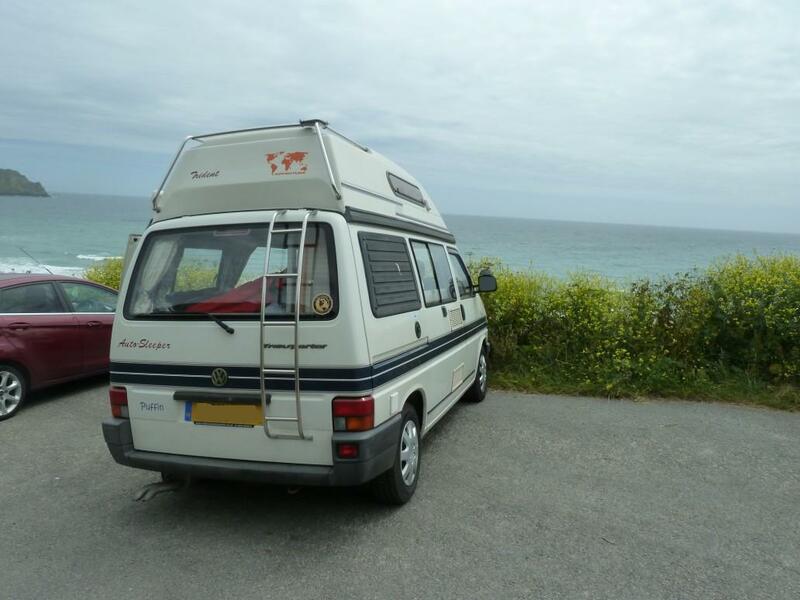 We parked up at Lelant saltings Park & Ride and caught the train into St Ives arriving at the station above Porthminster beach having travelled along the stunning coast line of Hayle and Carbis Bay. 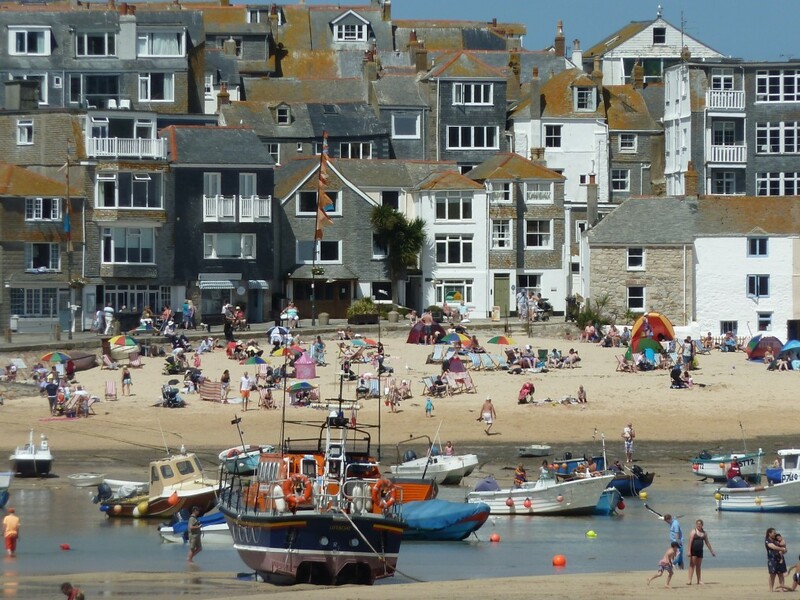 St Ives has changed so much over the years that we’ve been visiting. Expensive restaurants and boutique hotels have appeared to satisfy the upwardly mobile clientele. We opted for lunch at the Beachcomber café. 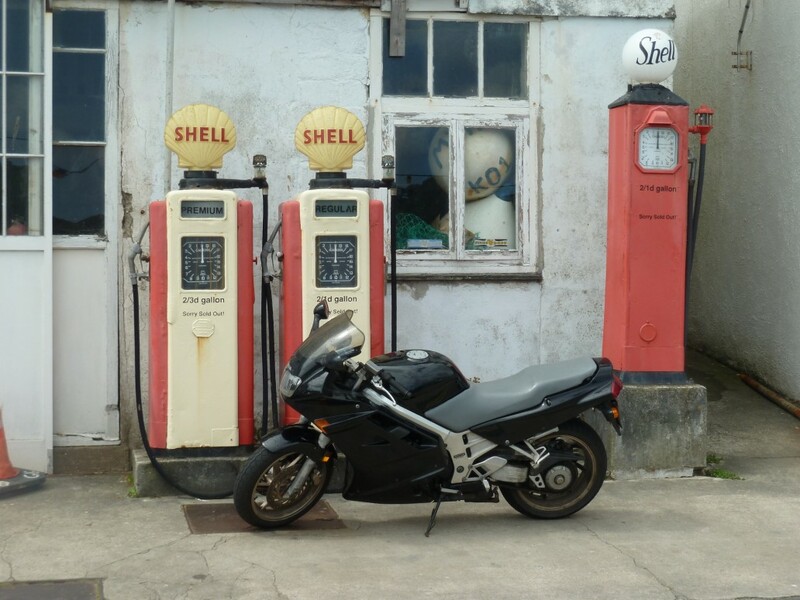 This used to be an extremely popular down to earth café that served a full English breakfast, a traditional Sunday roast at lunchtime or a Cornish cream tea in the afternoon. It’s still a popular café serving good food with a more varied menu, just a tad more expensive. After a walk around the town we headed back to the train. Back at the car park Puffin was fired up and headed south. We are revisiting a few places in Cornwall that we haven’t been to for some years and Penzance is one of them. The last time we visited we were hungry and it was raining. We couldn’t find anywhere to eat so we left. We needed to give the place a second chance. Parking was easy on the quayside and it looked like you could overnight in a campervan, well it didn’t say you couldn’t. To be fair we arrived late when the shop were starting to shut. Penzance was certainly in better shape than the last time we came, nothing spectacular, but may be worth exploring when we have more time. After an hour of mooching we set off for another place on our revisit list. The highlight of Penzance was a visit to the first Morrisons we had seen in Cornwall. The Extreme knitter wanted to visit the nearby Sainsburys store instead. I do worry about her. Morrisons finest bread and milk were purchased, Puffin was fueled up. Living the dream. The furthest that you can travel south in Great Britain. 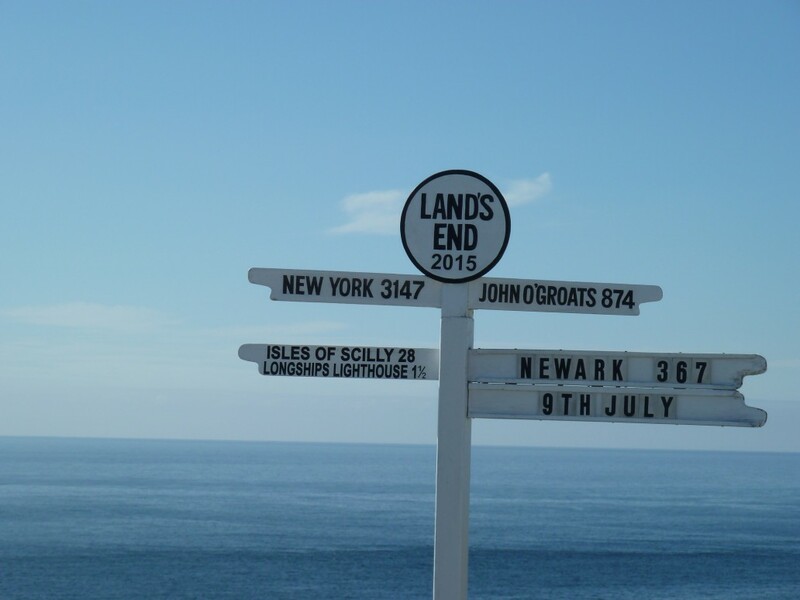 We have only visited Lands end once before many, many years ago and weren’t impressed, however because we would be visiting John O Groats during our future Scottish trip in September the Lands End to John O Groats thing kicked in. We will become “End to Enders”. Ok, there would be interval of 2 months before reaching the goal it seemed the right thing to do. When we first visited here there was nothing apart from the last house and the famous sign. Lands end is now marketed as a theme park. The last house and the sign are still here. You have to pay to have a photo taken with your hometown on the sign, but you can still take a random photo without charge. Oh dear what a miss match of commercialism. 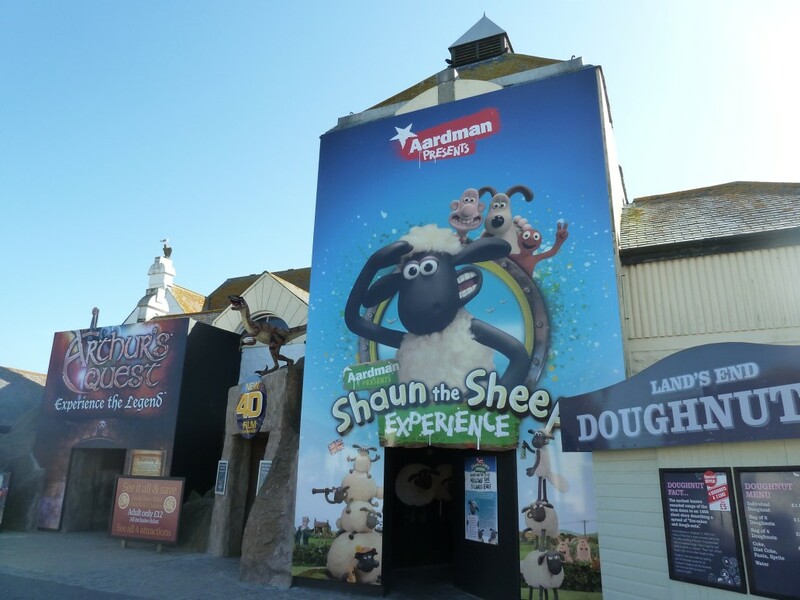 Shaun the Sheep and Arthurs Quest Exhibitions and a few shops. Luckily it only cost £2 to park. We arrived after 5pm when everything was shut and we could wander around without the tat. 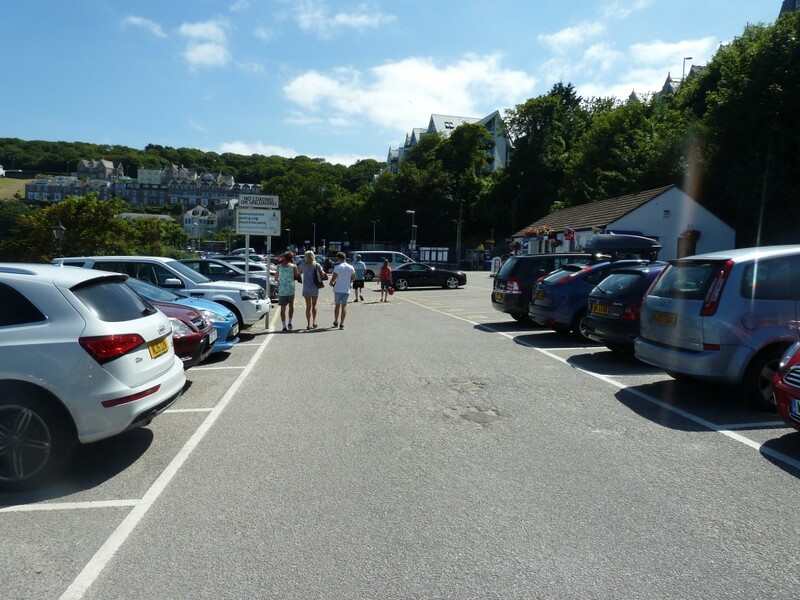 Whenever we have previously visited Falmouth we would park the car on the Quay side car park or use the Park and Ride/Float service. The Quay side parking was out of bounds due to a 2.3mtr height restriction (we are 2.5mtrs high). 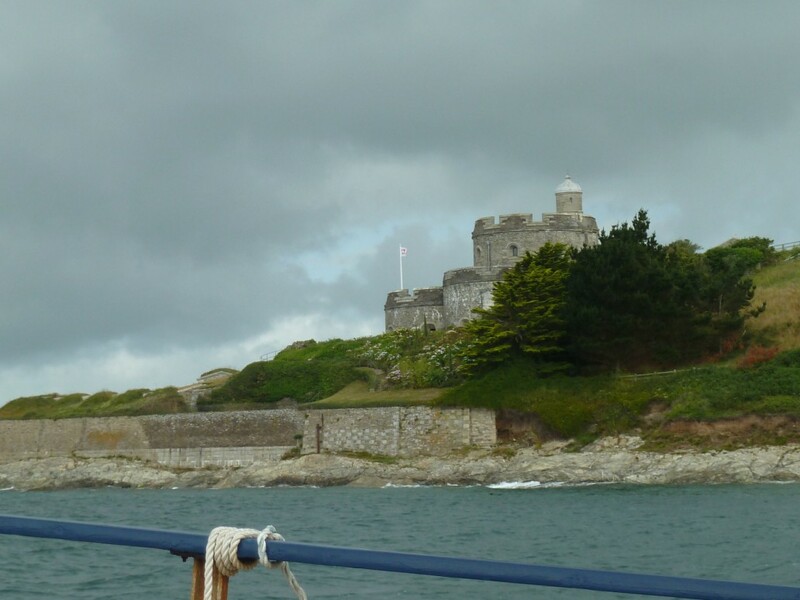 To experience something different on this visit I decide to park up in St Mawes and catch the passenger ferry from there across the bay to Custom quay in Falmouth. 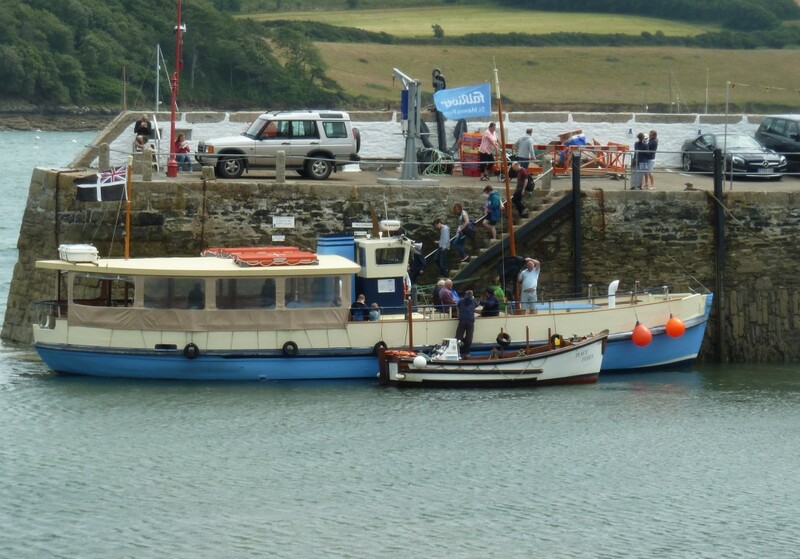 The cost is about the same as driving to Falmouth and parking, but you get a 20 minute boat trip included. 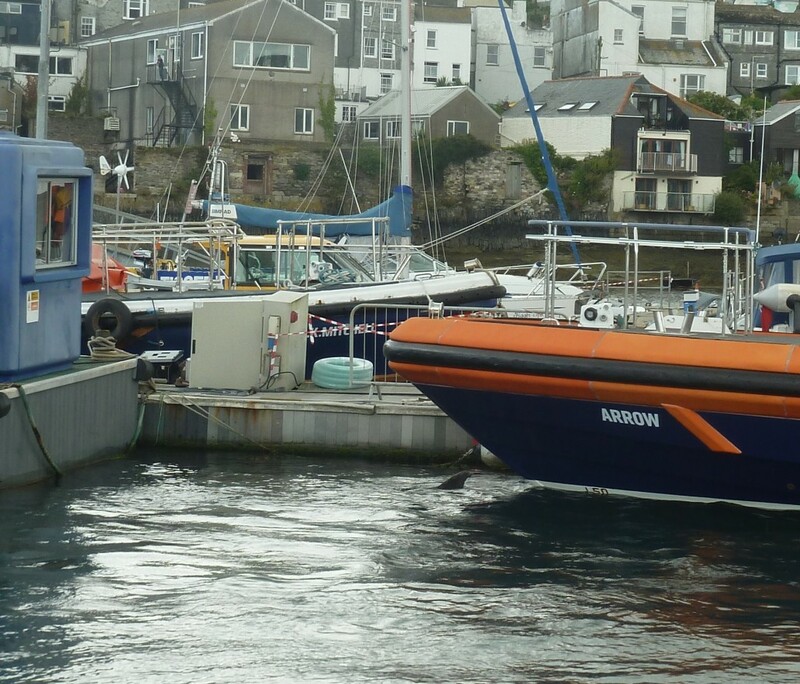 The trip across is fascinating as you enter one of Cornwall’s main ports. 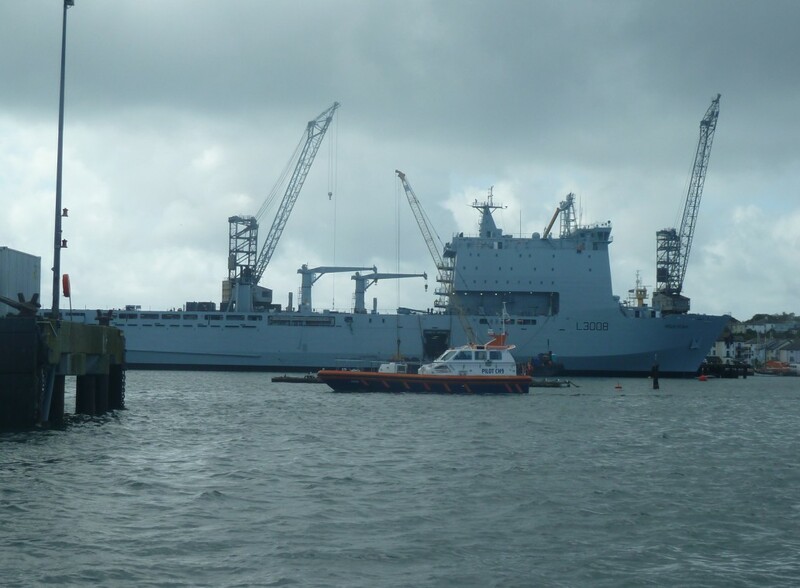 It was so different seeing Falmouth from the sea with its large ships in the dock. We disembarked at Custom Quay located beside the Maritime Museum. We had decided to have breakfast in Falmouth and I wanted a full English. A short walk up from Quayside into Arwenack street and we found a small café called “Earth & Sea” at No 28. The breakfast here was superb, made with quality food, particularly the homemade Lincolnshire sausage. The excellent service and atmosphere make it a must visit. I broke the extreme knitter’s favourite bowl yesterday and I looked around various shops looking for a suitable replacement. Alas nothing yet, but I’ll keep looking. 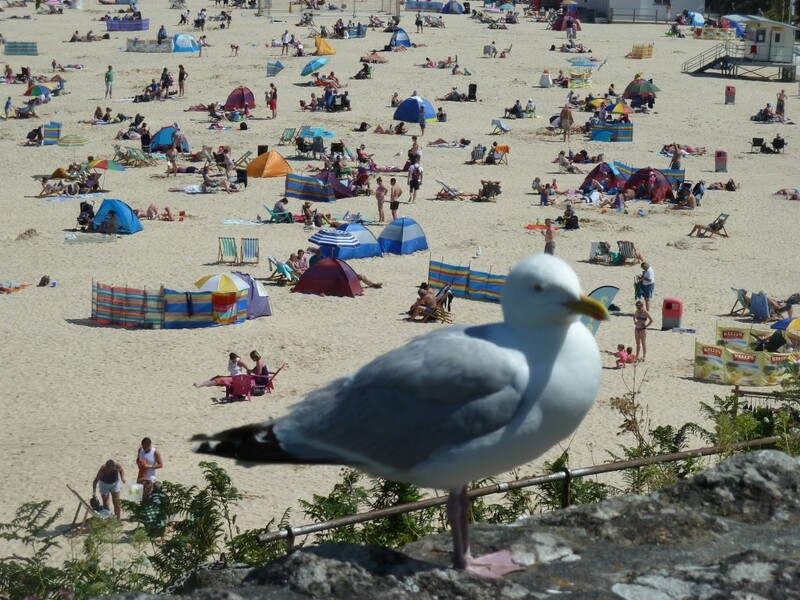 Falmouth is an easy going town with lots to see as you wander around. After the breakfast we didn’t need lunch, so just had a coffee & cake. At about three in the afternoon we headed back to the ferry. The ferry had just come back in and there were people on the dock looking at a nearby boat that had just arrived. Then we saw it. 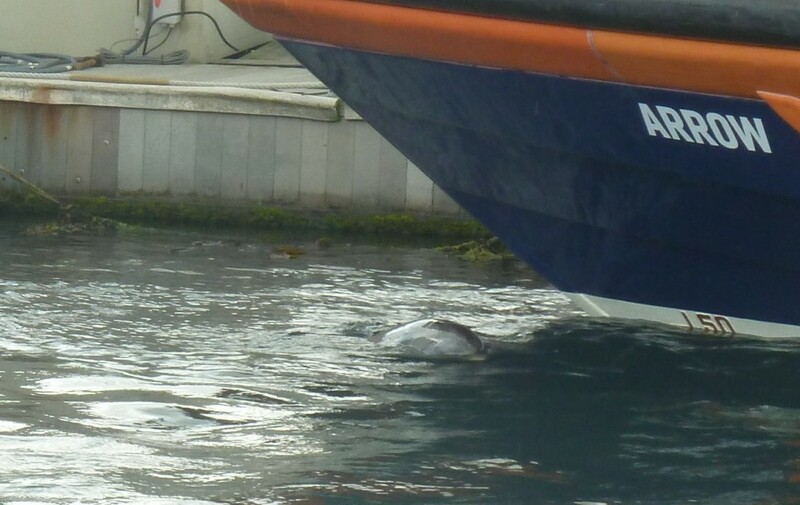 A dolphin was swimming around the moored boats. 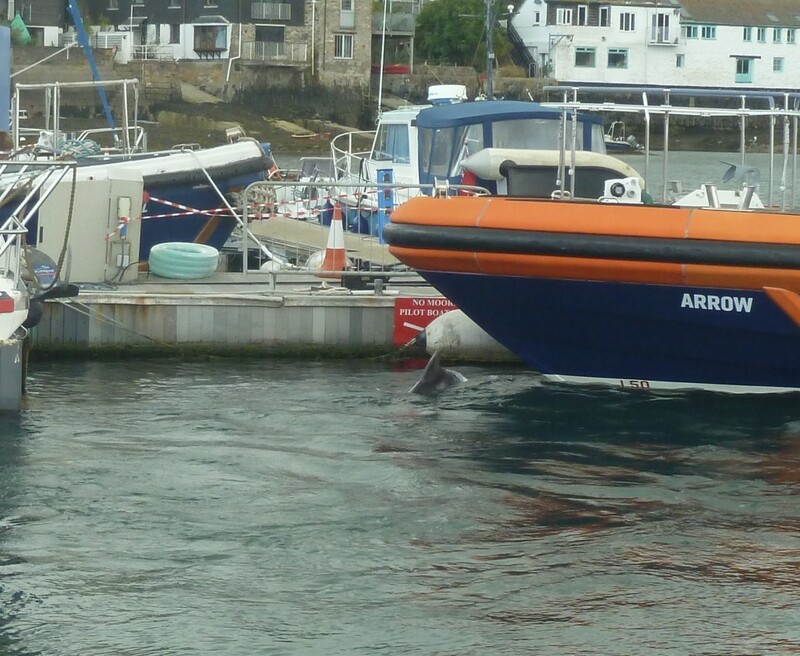 The ferry skipper slowly sailed over to the other boats and stopped so that we could see this solitary male dolphin. It’s always a privilege to see these creatures at close quarters. I have yet to take a good photo of a Dolphin, but these show bits of dolphin, fins & top of the head. 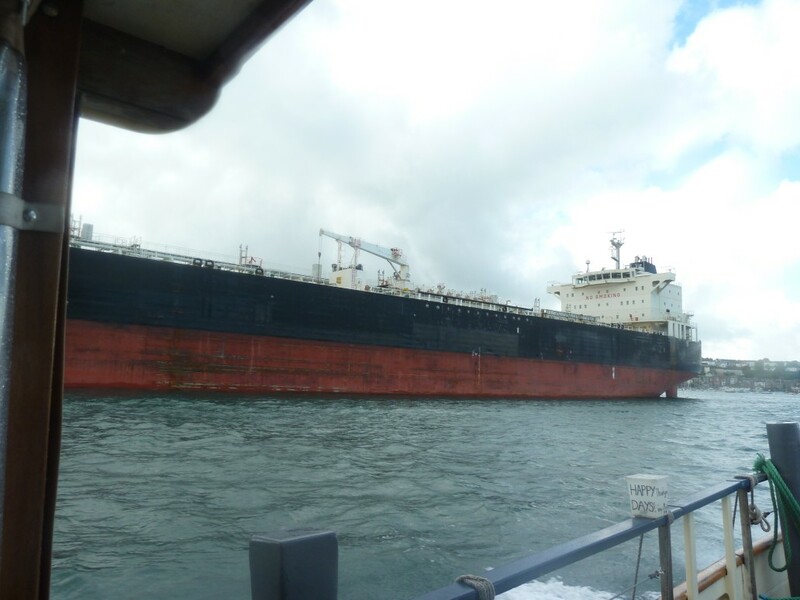 The sail back was choppy and invigorating. Back at St Mawes the ferry docked and we staggered up the quay side steps as we regained our land legs. At the campsite the E/K prepared a salad with ham and Cornish Yarg cheese. The cheese is totally wrapped in stinging nettles to mature. The technic was invented by a man called Gray, hence it’s called Yarg being Gray spelt backwards. Sunday morning and it had rained in the night, so we were slow rising and just chilled. A late breakfast of bacon sandwiches (Yes, just slices of bread, no baps). Our first night highlighted the items we had forgotten to pack. Pillows, our pillows were still at home, so a trip to Truro, the capital city of Cornwall was called for and a visit to the Tesco store provided some cheap pillows to last us through the holiday. We bought a Cornish pasty for our tea from well-known bakers, which was horrendous. The quality of the Cornish pasty is so varied. If you ever find one that satisfies the taste buds then make a note of where it was purchased for future reference. 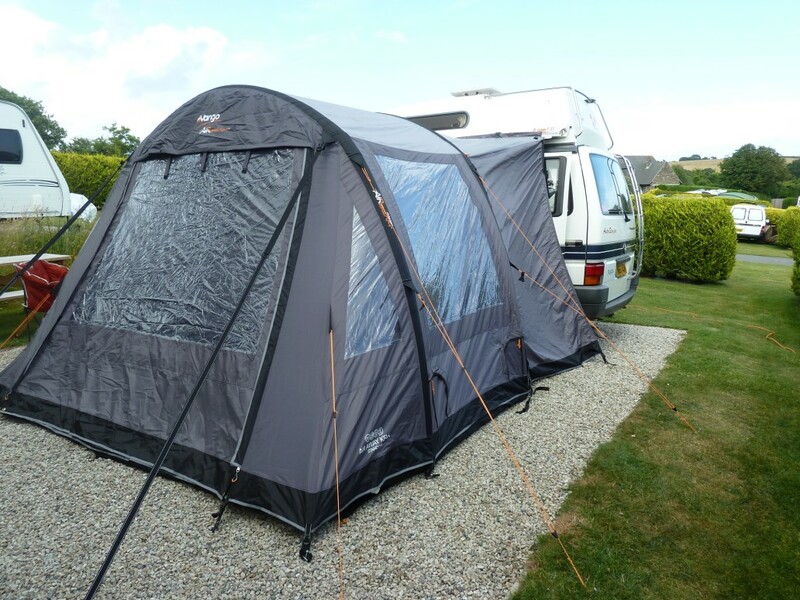 Having Puffin has opened up our ability to camp and visit places we couldn’t go to for various reasons when using our folding camper, but one site that we had visited before with the folding camper was Trethem Mill Campsite, St Just in Roseland in Cornwall. I’m not one for well organised manicured campsite with regimented rows of caravans, but this manicured site is different. The award winning site is laid out in nooks and crannies created by hedges giving privacy and a random layout feel to it. They appear to be running out of wall space to display the accolades they keep winning. The facilities are superb and clean. There is a massive dog exercising area and a kids exercising area, but still retains it’s chilled out atmosphere. Fish & Chip van visits on Saturday and Wednesday evening and a stone baked pizza van visits on a Friday evening. We always feel guilty not bringing Ruby with us, as the campsite dog facilities are one of the best we’ve visited, but shopping. Eating out and the restrictions on dog walking on the beaches during the summer would hamper our enjoyment. I know that they say the trip is about the journey not the destination, but the journey down the M5 and A30 is not interesting. When you are sitting in yet another traffic jam it becomes a nightmare and the destination is the ultimate desire. After 5 and a half hours driving to get here the fish & chips were welcome. Following my last post about Baps, the Extreme knitter has announced that she’s getting fed up with Baps and could we have a change. I’m devastated to say the least, but hey I’m not one to hold a grudge or resist change. Today I purchased “Crusty Cobs” to make up for our nibbles when travelling down to Cornwall tomorrow. I’ll probably fill them with ham and lightly smear with mustard. The Camper has been fuelled up and packed with far more clothes & things than we actually need for a week away. 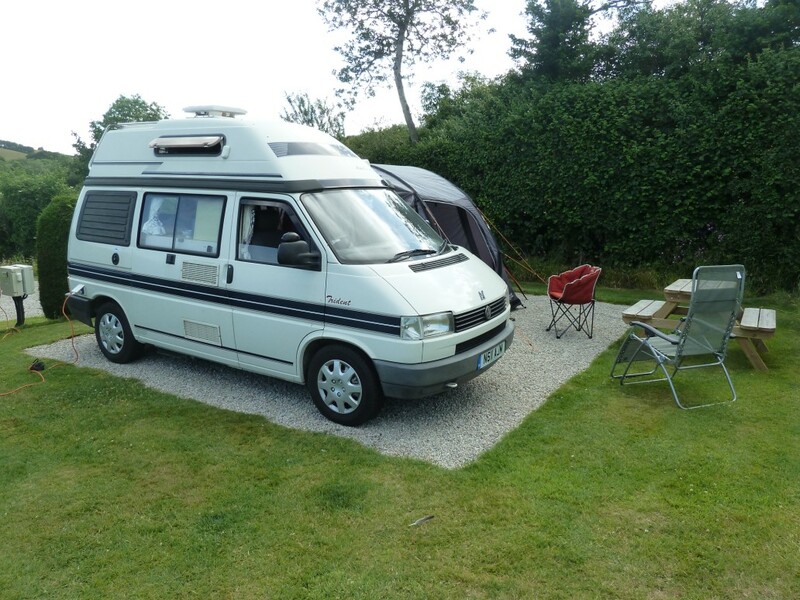 We will depart tomorrow heading for a campsite in St Just In Roseland.